BYD has landed its first SkyRail contract in South America with a new deal with the Brazilian city of Salvador that will see a stretch of the overhead light rail system running over the water. BYD’s demonstration installation of SkyRail at it’s headquarters in Shenzhen, China. The new deal will bring a 20 kilometer stretch of BYD’s SkyRail to Salvador’s beautiful seaside, with one stretch of the run spanning a gap over the sea to connect an offshore island to the mainland. The $689 million project is broken up into two phases, with construction on the first phase set to begin in the last quarter of 2018. The new system was designed to link together different parts of the city and, more importantly, the existing subway system to give residents options when moving around the city of 3.8 million residents. Salvador’s unique landscape made BYD’s SkyRail a great option, with its ability to climb hilly terrain without issues. In one stretch of the run, the track will climb 80 meters over a 400 meter span of track. 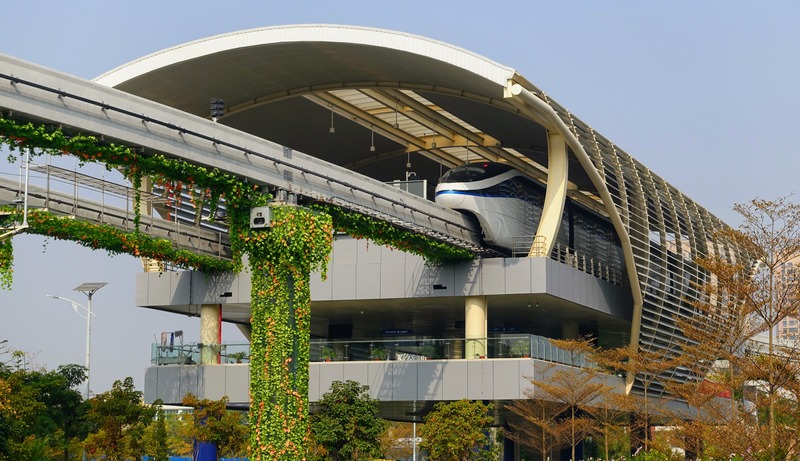 SkyRail’s autonomous driving system was also selected because of its nearly silent, zero-emission transportation. Its elevated track minimizes the impact of the installation and operation to the city while delivering functional, high-throughput transportation to city residents. The new installation in Salvador, Brazil, joins a handful of SkyRail installations in China and others in the Philippines, Egypt, Morocco, and Cambodia.